A sushi experience like no other. Along with the innovative sushi at Sushisho Saito, you are treated to a series of appetizer-like dishes called otsumami, carefully interspersed throughout the meal. Devouring bites of different textures and temperatures, market-fresh and aged fish, with various toppings and finishing touches, all as you watch the softly spoken and kind sushi master at work. It is truly a pleasure to dine here. Remove your shoes, sweep across the fresh green tatami and take your seat at the 10-seat sunken soft pale hinoki counter. A calligraphy painting adorning the wall sets the tone for your evening with bold characters for anraku, meaning peaceful and pleasurable. 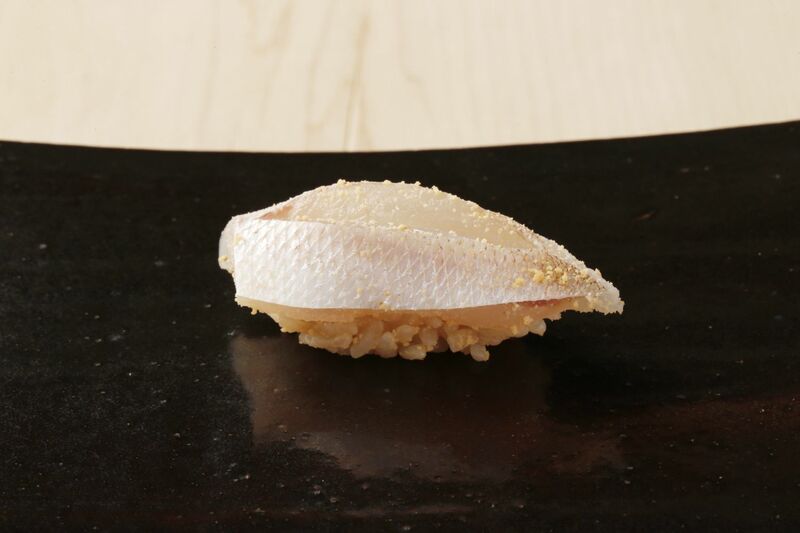 The clean, pure tones of the interior, the silvers and pinks of the fish and the itamae gracefully wielding his long, sharp knives– it is a feast for the eyes as well as the taste buds. 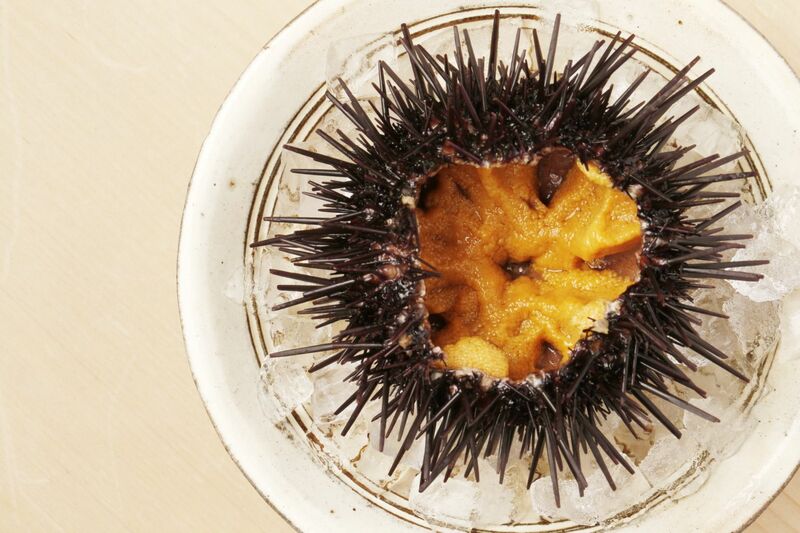 Enjoy Innovative Traditional Sushi at Sushisho Saito. 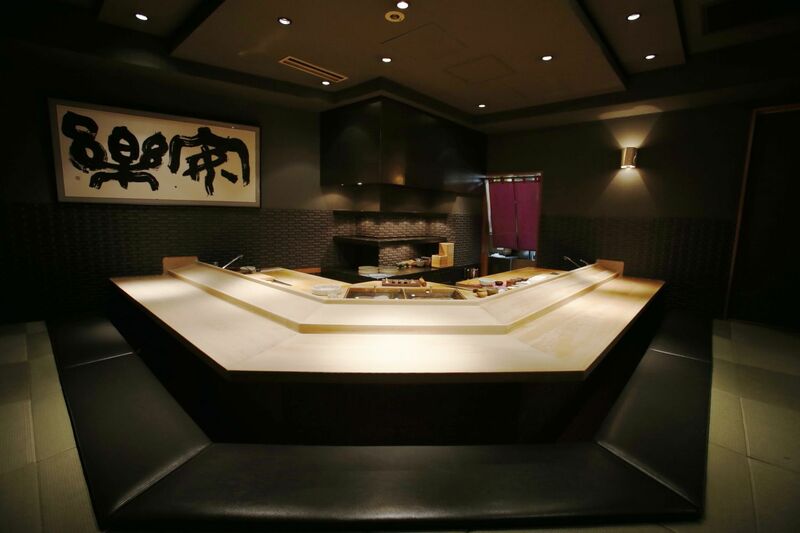 The style here is omakase – you leave everything in the hands of the chef and a course filled with delicious dishes begins. A somewhat shy and unassuming man, sushi master Toshio Saito engages carefully and measuredly as he creates each dish. Nigiri sushi are interspersed between a variety of tsumami side dishes, taking you on an adventure through colors, flavors and textures. The journey will be even more enjoyable if you take the chef’s recommendations on the perfect nihonshu to match any dish, be it fresh and supple or charred and smoky. For Saito, variation is the key. The simple presentation masks meticulously prepared layers of ingredients. A small knob of daikon, a few tiny rounds of green onions, a golden powder of vinegared egg yolk – Saito selects the components to build the flavors and textures that come together in one cohesive delicious bite. So perfect as it is that there is no dipping into soy sauce. INGREDIENTS He gently takes up a small handful of vinegared rice, carefully molding it with his delicate hands before topping it with a dot of wasabi and the best fish and shellfish sourced from trusted suppliers he has built relationships with during his 30 years as a sushi chef. Ingredients are procured from Tsukiji fish market and various suppliers every morning guaranteeing the freshest flavors for your meal. 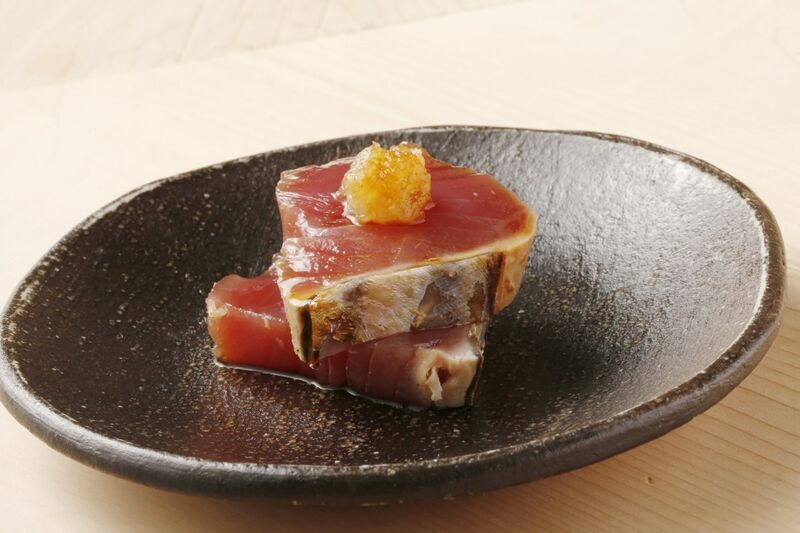 Some varieties are served fresh from the market, and others such as maguro are aged for greater depth of flavour. 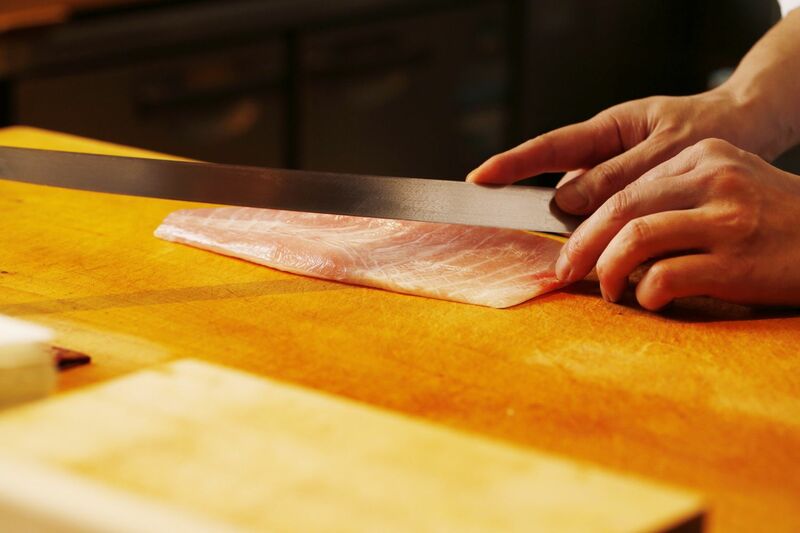 The morsels of fish are sliced just before serving with Nenohi knives, which Saito says he switches depending on his mood. The knives are hand-forged by skilled artisans and loved by chefs for their flexibility and durability. Based on the ancient art of sword-making, these characteristics can only be achieved by heating the metal at low temperatures, requiring a great deal of patience and precision on the part of the artisan. 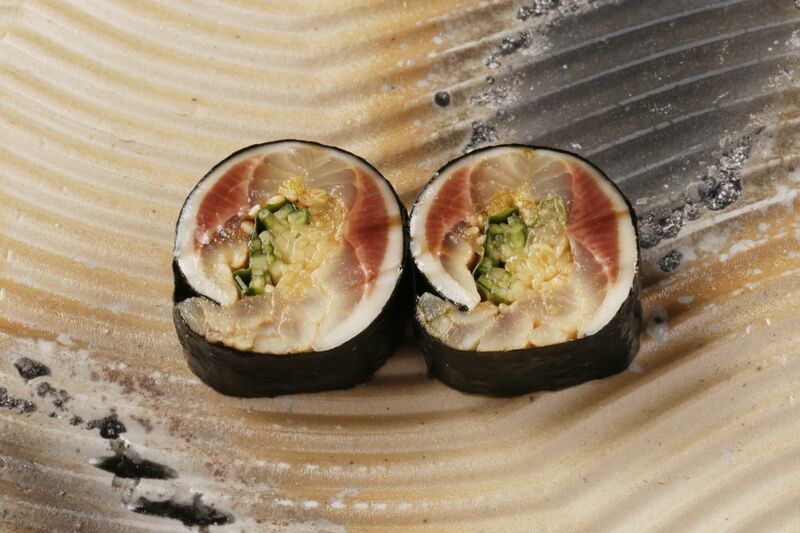 One factor which will make this sushi different to most you have had before is the shari. Saito has devised recipes for two varieties of vinegared rice to highlight the innate flavors of the seafood morsels that top it. 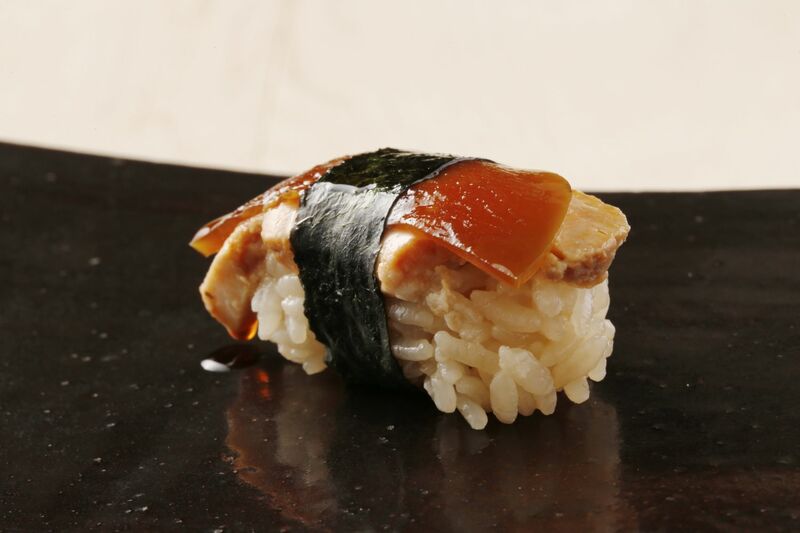 The delicate but umami-rich flavors of the rice are another reason you will not want to dip the sushi into soy sauce. 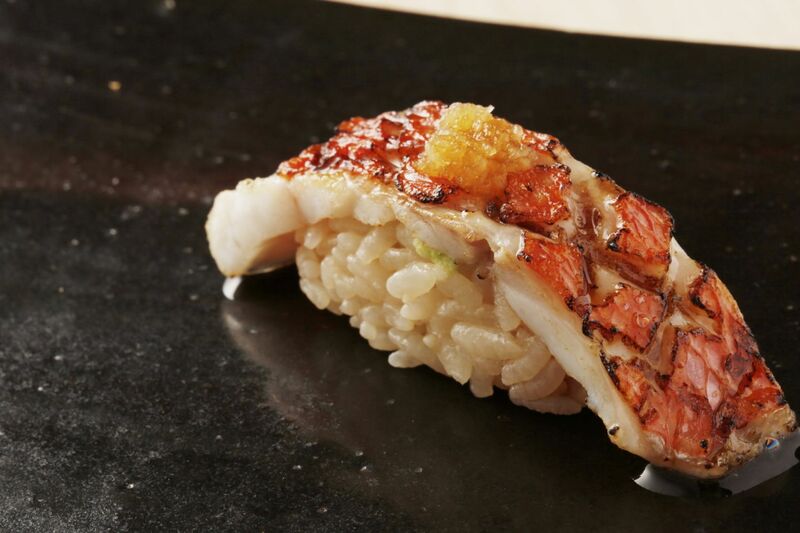 A darker, richer piece of fish or shellfish is paired with rice flavoured with red vinegar, which has been fermented with sake lees. A white fish is carefully laid on top of a traditional vinegar shari so as not to be overpowered visually or in flavour. 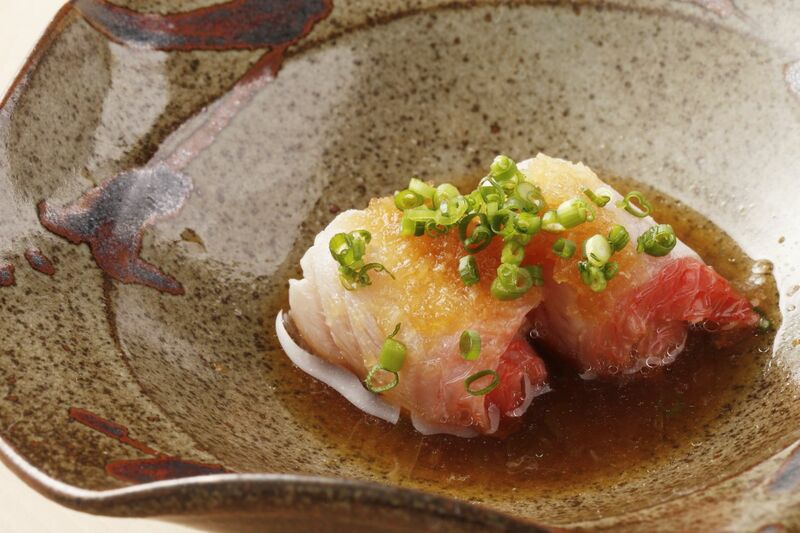 The slightly grilled skin of red sea bream (kinme no aburi) is brushed in one soft stroke with a delicately sweet soy sauce, like an artist putting the finishing touches on a painting. 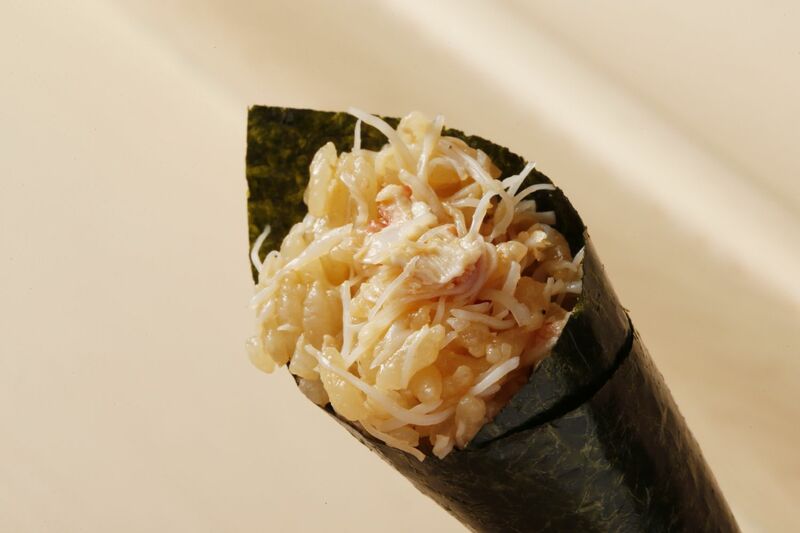 One signature dish comes straight from the chef’s hands: kegani no temaki – a piece of freshly roasted seaweed lovingly filled with a mixture of crab meat and vinegared rice. 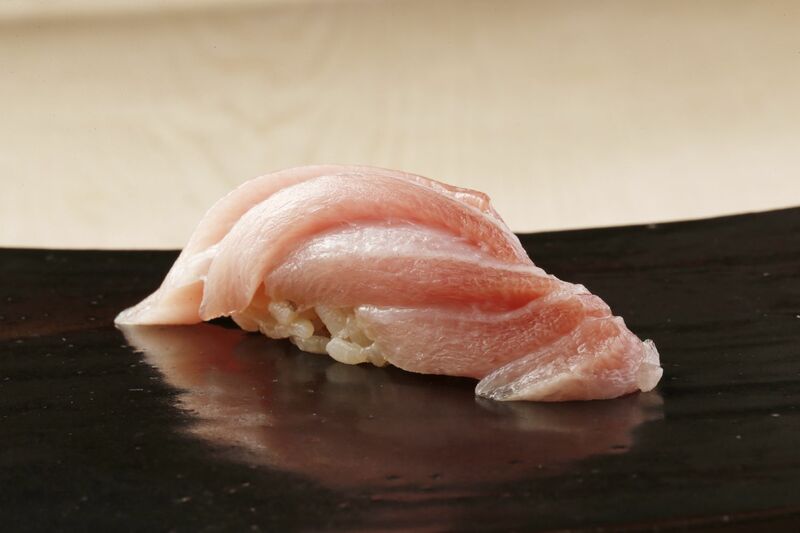 The journey for sushi master Toshio Saito all began in Yamanashi, best known as the home of Mt. Fuji, and ironically one of Japan’s few landlocked prefectures. As the third son, Saito was unburdened by career expectations from his family. Free to choose whatever path he liked, he set off for Tokyo at the age of eighteen with no clear goals and no formal training in any field, and soon found himself working under a sushi master. At first he didn’t like his job. He couldn’t see the fun in it and contemplated quitting every time he mastered breaking down another fish. But he stuck at it, and little by little developed a great respect for the talents of his master and a desire to constantly push to the next level. Not afraid of change, he travelled to New York serving up sushi to NOHO gourmands for more than six years. In search of something new again, he returned to Tokyo and was reunited with his former superior Keiji Nakazawa, and started working for the master at Sushisho in Yotsuya. A sushi apprentice refers to the master as oyakata, which includes the characters for ‘parent’ and ‘the way’. This person is intended to be a father figure, guiding the way for his apprentice. You can see that is true in Saito’s relationship, as he talks fondly about how the people he worked with are like a family and how he learned so much from his oyakata about interacting with customers and true omotenashi. When the time came for Saito to go out on his own, Nakazawa was nothing but supportive, even introducing customers to Saito. VISION When asked about his vision for the future, Saito selflessly talks about his hopes to nurture and mentor many future sushi chefs. He wants people to be inspired by his food into joining the profession. A proud smile spreads across his face as he talks of two apprentices who have already opened their own sushiya. He feels strongly that a sushi master cannot be born from a cooking school – you need to apprentice to a master to learn the art. Handling fish and holding a knife are far from the first steps. It starts with respect for your master, your ingredients, your customers and your space. You clean, observe, and communicate. As for his own sushiya, Saito says he will carry on as he has done until now, adding touches and changes gaining inspiration as he dines out at restaurants of all cuisines. A current favorite is a local place where he goes for a fresh plate of oysters and a glass of sparkling or white wine to reflect on the day and relax. This is where he recharges for his next opportunity to entertain guests with their regular favorites as well as original and seasonal creations. 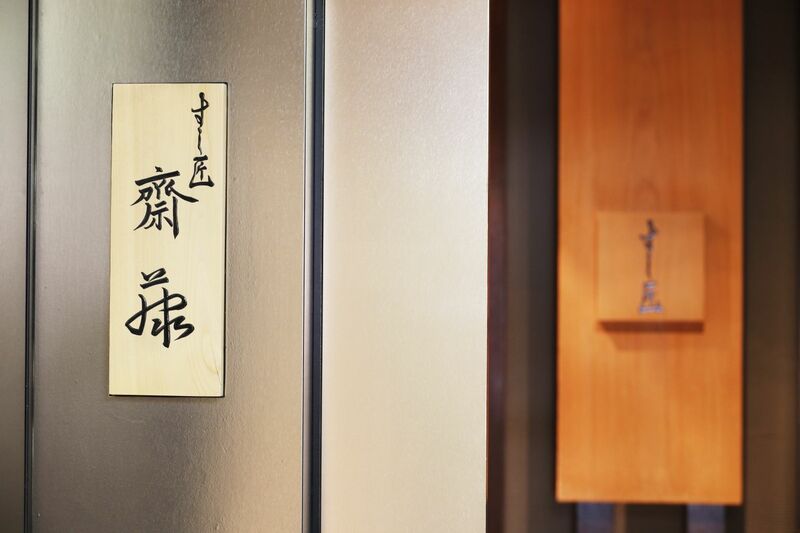 Reflecting on your meal and experience, that calligraphy painting that took your eye as you first went in seems to signify not only the ambience of the sushiya but also the chef’s character. Peaceful and pleasurable – Sushisho Saito is a truly enjoyable dining experience. The pieces are placed on thoughtfully chosen dishes and handed to you like a small gift. 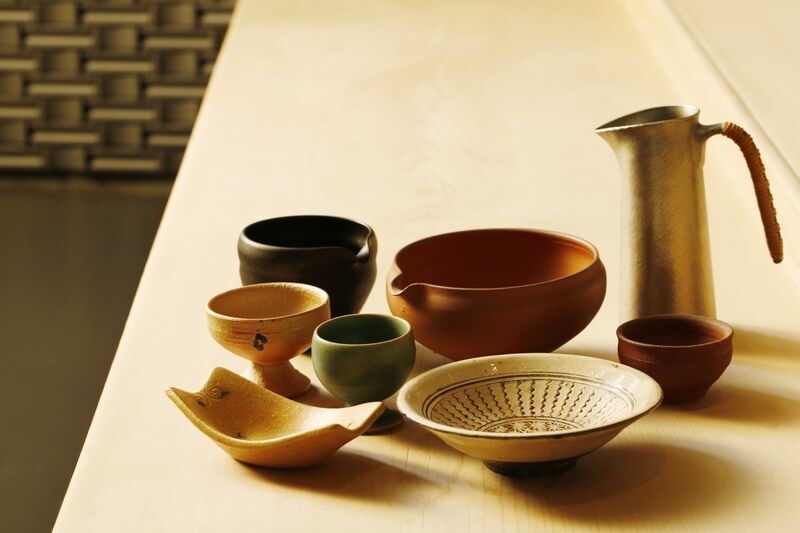 The dishes are all personally selected by Chef Saito, who twice a year attends exhibitions of his favorite ceramic artist, Yukiko Saito Barone of studio shigetsu. He loves the originality and personality of the works. Currently splitting her time between Italy and Japan, Yukiko Saito Barone has worked in studios across Japan as well as in Italy, Spain and the U.S., always inspired by her local surroundings. 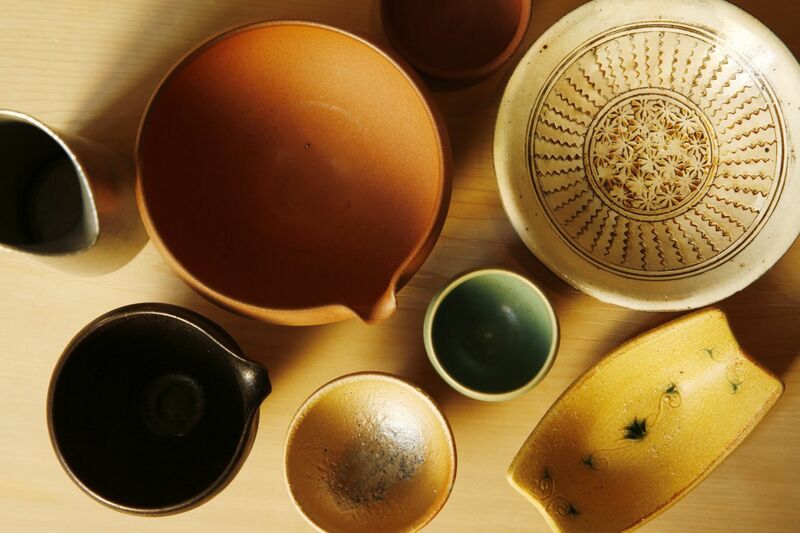 From sleek glazed dishes to textured or matte pieces and plates with lines or fragile little legs, the unique designs have a calming effect that lends them to Chef Saito’s delicate presentations. 2 starting time: 6:00PM and 8:30PM.